So you’re stuck in a rut, perpetually daydreaming about the moment that you can configure the 2016 Chevrolet Volt, are you? In that case, we’re happy to report that the 2016 Volt page on the Chevrolet website now has a nifty color and trim configurator, with a total of seven available colors. No, it won’t make the day of arrival of your new 2016 Chevrolet Volt come any quicker, but it will at least help you to better visualize the vehicle parked in your own driveway. The car’s body looks somehow softer and more rounded in the latter of these shades of white, while the former accentuates every crease and contour in heightened contrast. 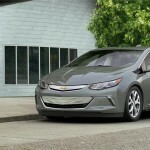 With the exception of the Kinetic Blue Metallic paint shade, all of the available colors on the 2016 Chevrolet Volt look quite earthy and natural, which perfectly suits an earth-friendly car like the new Volt. Of course, that’s not to say that there’s anything wrong with the Kinetic Blue Metallic hue. But it does stand out as the only available color that couldn’t possibly blend in with a rock cliff face or a woodland area. What color would you have on the new 2016 Chevrolet Volt? Talk to us down below. They need more vibrant colours, the blue and red look best. Heather grey looks more like primer, should’ve gone with a charcoal. Maybe add a darker blue and a green. Trivia: Kinetic Blue Metallic is a color I’ve ranted, campaigned, and pushed hard to bring back. Even got a hat tip from Mr. Reuss himself on that one. This is the first time Kinetic Blue has been used on a mainstream production car. It has been used on *one* Saturn Sky, *one* Pontiac Solstice, and *one* Pontiac Solstice Coupe. The color was going to be a standard Kappa color, replacing Hydro Blue the year prior. The Wilmington plan team pushed out one of each prior to turning the lights off. It was then used on 1,524 Hot Wheels Edition 2013 Camaros. It’s also slated to be a standard color on the 2016 Camaro, ending the drought of electric blue’s on non-Corvette performance cars at GM (though Perfect Blue is coming back to the SS too – a successor to Stryker Blue on the G8). I’m repainting my Saturn Sky Red Line in Kinetic Blue, so yeah, I’m biased here. I’ll take the flat white (Summit white). As green as the volt is, it’s somewhat puzzling why that color is not on the table. GM’s dark green metallic is a very attractive color. 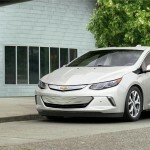 I want to buy a Volt that is green, heather green,or sage green. I liked the tideland pearl that Prius sold in 2004. 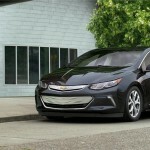 Volt is a green car; humor me GM! nearly black, but on bright days it was a killer dark charcoal metallic. I’m with everyone who likes Kinetic Blue. That may be my choice, but I have to see them in person first. green ) would be appropriate for a car that is easy on the planet. in and of itself – making Prius feel like a Big Wheel. Most of all, I like the sporty appearance of the car. They need a biege and orange like some Subarus I’ve seen running around and a lightish brown. People that buy these want to be noticed. That kinetic blue is fantastic, I was surprised to find out that that was not a standard GM color. I find those gray colors just depressing. I currently drive a forest green 1998 Tacoma, I do wish the Volt came in that color. Green seems to be the red-headed stepchild of colors for cars.